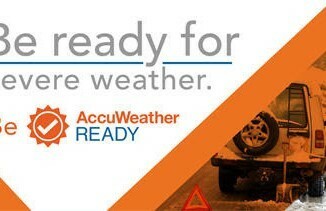 AccuWeather-(ENEWSPF)- AccuWeather reports the chilly air swinging through the northeastern United States will not relinquish its grip until at least the middle of May. For most, the cool pattern will result in temperatures averaging 10 to 15 degrees Fahrenheit below early May averages. For some, the pattern will be more reminiscent of winter as wet snowflakes can fall. In other areas, a frost or freeze will occur. 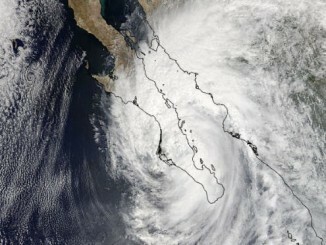 Clouds, a slight breeze, urbanization or proximity to water protect many areas from a frost. 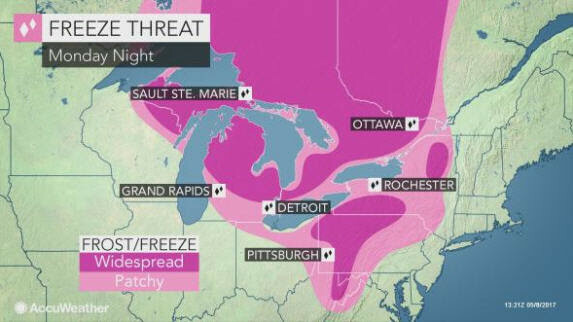 However, people in the suburbs and rural areas of the mid-Atlantic, Upper Midwest and western New England will need to take preventative measures to protect tender plants from damage during multiple nights this week. 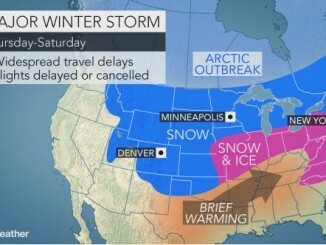 “There will be a risk of a frost and freeze where skies become clear and winds diminish through Thursday morning and perhaps Friday morning in some locations of the Northeast,” according to AccuWeather Senior Meteorologist Alex Sosnowski. “The coldest locations in the rural valleys of the central Appalachians will dip into the middle to upper 20s Tuesday morning and the upper 20s to lower 30son Wednesday morning,” Sosnowski said. The coldest spots may dip into the lower to middle 30s on Thursday morning. Heavily urban areas, such as Boston, New York City, Philadelphia, Baltimore and Washington, D.C. should be safe from frost. However, in rural coastal areas, such as central Long Island and New Jersey, where a sandy soil is predominant, temperatures can dip to frosty levels. Afternoon highs will stay unseasonably cool in the mid-Atlantic despite appearances of the strong May sun. Even as the chill eases by midweek, highs in the 60s will still remain several degrees below normal. The brunt of the chill will linger across upstate New York and New England, where clouds will be more stubborn to erode and wet snowflakes can mix with rain showers through Tuesday. Any accumulations will be very light and remain confined to non-paved surfaces in the highest terrain. Those hoping to once again break out the shorts and t-shirts for warm weather activities will likely have to wait until the second half of the month, when near- to slightly above-normal temperatures are expected to return.